When discussing which dog breed has the strongest jaw, it is important to keep in mind that this is a rhetorical question that cannot be answered in a definite way. The strength of a dog's bite will vary from breed to breed, animal to animal, and even circumstance to circumstance. Bite force is the scientific term for the measurement of the amount of pressure in a dog's bite. Obviously, the greater the pressure a dog can exert, the more potential for damage there is to someone (or something) that is bitten. There are several factors that determine bite force, but scientists agree that the size of a dog's head has a lot to do with the amount of pressure it can exert with its jaws. 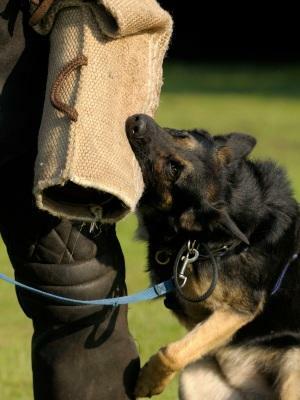 Trained dogs typically have a higher bite force than untrained ones. A human averages 120 pounds bite force. The strength of the bite of a breed can't be measured with any accuracy because you can't teach a dog to bite with consistent force time after time. The bite will be different each time it is measured, and each dog will have a slightly different measurement. It is important to keep in mind that when the bite force of a breed is discussed, it can only be in a general way. The top five domesticated breeds thought to have the strongest jaw are all large dogs known for their bite. They are generally the same breeds attributed with the highest rate of attacks on people, and they are often listed as dangerous dogs. The Pitbull bite was measured at 127 pounds of pressure by Dr. Barr which, incidentally, is only 7 pound more than a human's bite pressure. Although the German Shepherd was originally bred as a herding dog, it has been used as a guard dogs and police dog with good reason. This is a powerful and intelligent breed. The German Shepherd's bite measured 238 bite force, just slightly above the Pitbull. The Rottweiler, or Rottie as it is often called, has a huge head and large jaws. This breed bit with 328 pounds of pressure. So, the Rottweiler is considered the second most dangerous breed of dog; the Pitbull is number one. Dr. Brady Barr of National Geographic did several tests of bite force with numerous animals, including dogs and wolves, to see which had the strongest jaws and the worst bite. Not surprisingly, the wolf was the canine with the most powerful bite, measuring 406 pounds of pressure. A wolf can, when it is protecting itself, inflict a bite that carries up to 1,200 pounds of pressure. To answer the question regarding which dog breed has the strongest jaw is difficult because there are so many variables. Of the dogs that have been scientifically tested and recorded, the Rottweiler appears to have the strongest jaw. If the rumors are true, however, the Doberman has the strongest jaw of all of the domesticated breeds. Remember, this will vary from bite to bite and animal to animal.